Brandon Meigs - Mowbray & Son, Inc.
Brandon Meigs graduated high school in Neodesha, KS. After high school, he started a career as a Millwright working at Minot Milling and various other locations throughout the United States. Brandon returned to Minot in 2000 and began his career as a Sheet Metal Apprentice at M & S Sheet Metal, Inc. He joined the local sheet metal union at this time. Brandon worked through the Apprenticeship program to Journeyman Sheet Metal Worker. He is currently a Foreman at M & S Sheet Metal, Inc. Brandon is certified in Quality Control and CPR/First Aid. He has been willing to travel to various work locations in North Dakota and Minnesota. 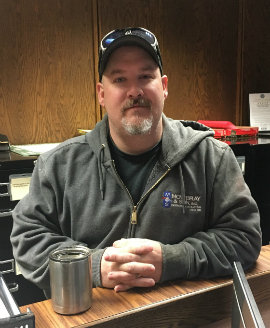 Brandon’s most memorable foreman responsibilities have been the MAFB B-52 Hanger, Erik Ramstad Middle School, and the 4 Bears Casino Event Center. Currently he is the Sheet Metal foreman on the MAFB Clinic Modernization project.